It’s dark, it’s cold, you’ve a ton of festive shopping to do, and your mouth has just taken a hit of horrible sores. Cold sores can be a source of great misery. They are both painful and embarrassing. The winter months can leave you a bit run down and this may cause you to be more vulnerable to these little patches of unpleasantness. Cold sores are caused by the cold sore virus otherwise known as Herpes Simplex Virus 1 or HSV-1. When the herpes virus first enters the body, it sits and waits in the body tissues in a dormant state. During this stage, there is no sign of disease. When the virus is triggered, it travels to the nerve endings in the skin and starts to replicate. This is when blisters occur – rapidly and sometimes without warning. Cold sores have been known as far back as around 2,000 years ago when the Roman Emperor Tiberius banned kissing because so many people were affected by the problem. Cold sores appear as small, fluid-filled blisters found in red, inflamed or swollen areas of skin on the face. Although the lips are the main area affected, cold sores may also be found around the mouth or near the nostrils (external openings to the nose). It’s time to turn to the bees. Propolis has been our go-to remedy for cold sores for years, and the latest research shows us just how correct we are to rely on it to keep us smiling as winter looms. Propolis is well known and loved by those keen on evading the blight of unsightly cold sores, for which it is particularly appropriate due to its dual ability to counter the virus responsible for the sores, whilst speeding up the healing process of the skin. Just what the doctor probably hasn’t ordered. Luckily you can get it for yourself. Bees mix plant exudates with beeswax to make propolis, a paste that can be smoothed over the inside of the hive. Propolis makes the hive more secure and simultaneously provides an antiseptic coating, reducing the growth of bacteria, viruses and moulds inside the hive. Mankind has adapted this useful material to his own medical needs. Propolis is rich in amino acids, trace elements and flavonoids, which work synergistically to provide the antiseptic, antibacterial and antifungal effect. Propolis inactivates the Herpes Simplex virus which is responsible for cold sores, stopping it from replicating and at the same time reducing the likelihood of bacterial infection around the site of the cold sore. Its local anaesthetic action means the cold sore will be less painful, and studies have shown that healing time can be cut by as much as 50%. 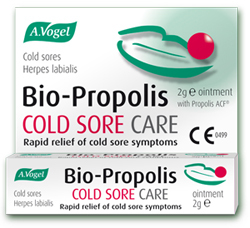 Bio-Propolis Cold Sore Care Ointment can soothe your cold sores – even if they have already erupted. The great benefit is that if you miss the tingle stage, it will still work. This handy little pocket/handbag sized tube will provide many applications. You only need to apply a tiny amount. Bio-Propolis is made from a unique patented propolis extract collected from a special variety of Canadian Poplar trees. It contains a specific spectrum of active ingredients, termed ACF – Active Complex of Flavonoids. There are a number of ways of lowering your risk of picking up or passing on a cold sore, avoiding recurrences. If you are feeling run-down, consider using herbs and supplements to help your immune system, such as Echinacea and vitamin C.
If you are prone to cold sores, avoid chocolate, gelatine, nuts and whole grain cereals. They contain a large amount of the amino acid arginine, which some doctors believe may trigger cold sores. 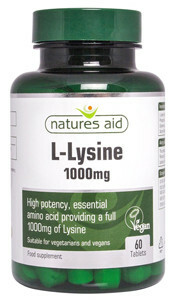 Lysine (an amino acid) is thought to counteract its effect. Take regular doses of the supplement L-Lysine and Vitamin C as this will starve the virus that causes the cold sore. Clinical studies have shown that Zinc helps the healing process, probably because it also enhances immunity.